Over the post-Thanksgiving holiday weekend we took a family outing to the factory outlet mall in Wrentham, Mass. Wrentham is about a half hour away from Boston, vaguely near Gillette Stadium and in the direction of Cape Cod. It's the town that truck-driving Republican Scott Brown was from when he was elected to the U.S. Senate. I've been shopping there for years. 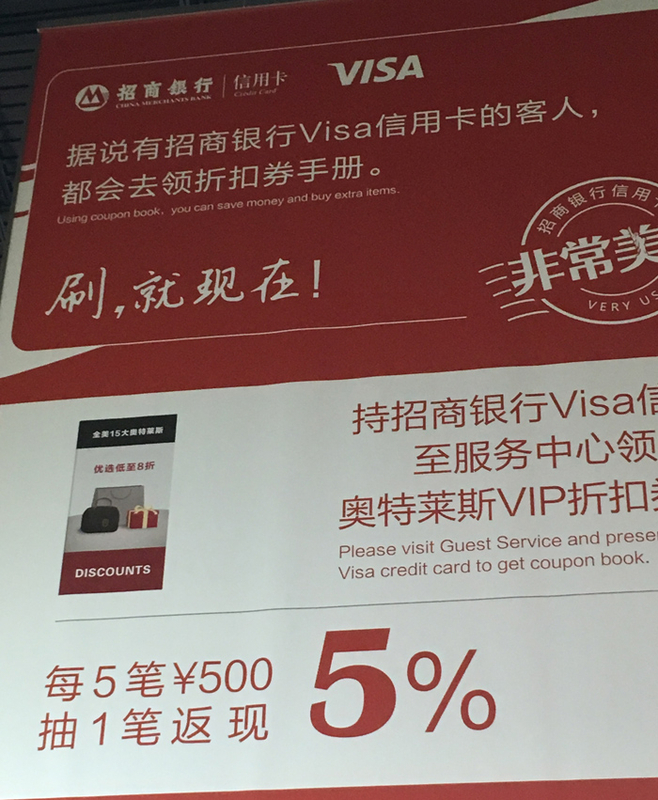 What was new on this visit was the proliferation of Chinese-language store signs throughout the mall. Here are two ads that were on display in the food court. 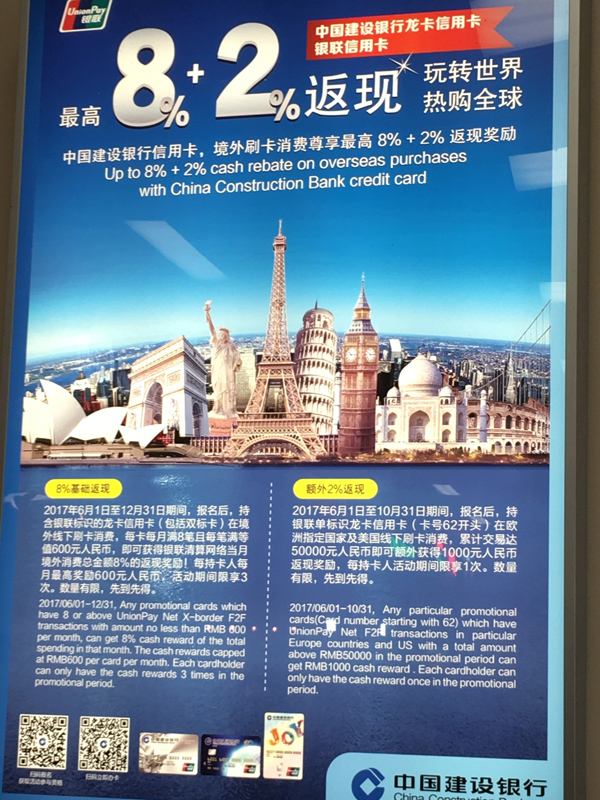 The ads are from Chinese banks offering credit cards. Remember, this isn't Flushing, Queens, or Chinatown in Manhattan, or San Francisco. It's Wrentham, Massachusetts. There are all kinds of different ways to view this phenomenon. It shows how free trade benefits America. American mall workers and apparel companies and real estate firms (the mall is operated by Simon Property Group) are making money from Chinese consumers. These benefits show up not only in big cities like Boston proper, where families of foreign students are buying condos and paying full tuition at colleges and universities and even prep schools, but also in more far-flung towns like Wrentham. But it also can feed anxiety, fear, and xenophobia. The ads in American shopping malls used to be in English, and aimed at wealthy, or at least middle-class Americans with disposable income. Now the highest-value ad target in a Wrentham, Mass. mall foodcourt is a tourist, foreign student, or visitor from China? It can be seen as a sign that America has been surpassed, or is in danger of being surpassed, by a country that not that long ago was a Communist backwater. At least the shopping is still better here, even if a lot of the clothes on sale were actually made somewhere in Asia or Latin America.